The Narva (Estonian: Narva jõgi, Russian: Нарва) (or Narova) is a river flowing into the Baltic Sea, the largest river in Estonia by discharge. Draining Lake Peipsi, the river forms the border of Estonia and Russia and flows through the towns of Narva/Ivangorod and Narva-Jõesuu into Narva Bay. 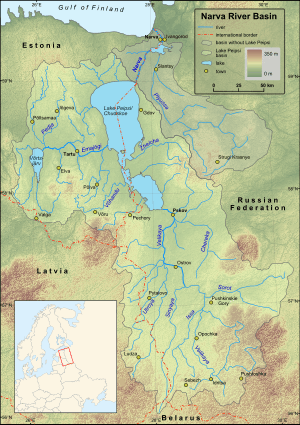 Though the river is only 77 kilometres (48 mi) long, in terms of volume discharged it is the second largest river flowing into the Gulf of Finland. 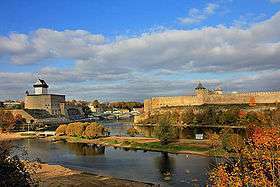 The river gives its name to the Narva culture and the city of Narva. The etymology of the toponym Narva is not clear, but according to the most common theory it comes from a Vepsian word narva meaning waterfall or stream. The Narva river has its source at the northeastern end of Lake Peipus, near the villages of Vasknarva (Estonia) and Skyamya (Russia). There are a few more small villages on the upper section of the river, for example Permisküla and Kuningaküla on the Estonian side and Omuti on the Russian side, but up to the city of Narva the shores of the river are mostly forested or marshy land. The river is dammed entering Narva and Ivangorod, forming the Narva Reservoir, which extends up to 38 kilometres (24 mi) upstream. 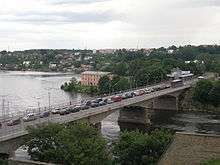 The Narva empties into Narva Bay near the Estonian town of Narva-Jõesuu, third largest settlement on the river after Narva and Ivangorod. The Plyussa is the largest tributary, joining the Narva at the Narva Reservoir from the right. Between Narva and Ivangorod the river flows over the Baltic Klint, forming the Narva Waterfall, once among the most powerful in Europe. Before the water reaches the falls it is split into two branches by the Kreenholm island, thus the falls consist of two sections. Kreenholm Falls, west of the island, is 60 metres (200 ft) wide and 6.5 metres (21 ft) high with multiple terraces. Joala Falls, to the east, is 110 metres (360 ft) wide and up to 6.5 metres (21 ft) high. The Estonian–Russian border follows the eastern branch and goes through Joala Falls. Since the creation of Narva Reservoir in 1955, the waterfalls are usually dry, but water is allowed to flow in the original channel for up to a few days every year. Access to the waterfalls is difficult as they are located in the border zone and the surrounding area on the Estonian side is closed industrial land belonging to Krenholm Manufacturing Company. The Narva was used as a trade route during the Viking Age, from 5th to 11th century. It was an offshoot of the trade route from the Varangians to the Greeks. 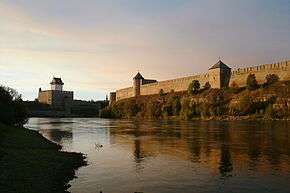 The Narva has for centuries been an important border river. Beginning in the 13th century it was the border of Medieval Livonia and the Novgorod Republic. Though in earlier periods Narva was part of a larger buffer zone between the two territories, gradually the river emerged as the exact border. Castles built on the river banks (Narva Hermann Castle, founded at the beginning of 14th century, Ivangorod fortress, established in 1492 and Vasknarva Castle, first built in the 14th century) were one of the main reasons behind this. Treaties from the 15th century between the Livonian Order and Novgorod Republic also recognize the Narva as the border. During the time of Swedish Estonia, when Ingria was also part of Sweden, the importance of the river as a border diminished. During the Russian Empire, from the end of the Great Northern War until the establishment of the Republic of Estonia in 1918, the Narva was the border of Governorate of Estonia and Saint Petersburg Governorate, with the exception of the town of Narva, which was part of the latter. By the Treaty of Tartu, signed in 1920, the Estonian–Russian border went slightly east of the river, up to 10 kilometres (6 mi), and, in particular, the town of Ivangorod was assigned to Estonia. In 1944 the former Estonian territory east of the river was transferred to Russian SFSR and the Narva was thus established as the eastern border of Estonian SSR, an internal border within USSR. In 1991 the same border became the de facto border of Estonia and Russia. Although no official border treaty has been ratified since then, today the Narva is the eastern border of the European Union and Schengen Zone. Tallinn–St. Petersburg highway bridge on E20 just downstream from the Hermann Castle and Ivangorod fortress. The bridge named Friendship Bridge was built in 1960 and is 162 metres (531 ft) long. Feršel, Anne-Ly (2010). The River Narva (PDF). Estonian Environmental Board. ISBN 978-9949-9057-4-4. Retrieved 14 February 2013. ↑ "Formation of city". Narva Museum. Retrieved 2009-01-11. ↑ (Estonian) "Sada aastat Narva jõe äravoolu mõõtmisi". Eesti Loodus. Retrieved 2009-01-11. 1 2 (Estonian) Suuroja, Kalle (2005). Põhja-Eesti klint. Eesti Geoloogiakeskus. ISBN 9985-815-53-X. ↑ "Narva - History". Retrieved 2009-02-13. 1 2 3 (Estonian) Selart, Anti (1996). "Narva jõgi - Virumaa idapiir keskajal". Akadeemia. 8 (12). ↑ "Russian-Estonian border agreement will be ratified". New Europe. 22 September 2007. Retrieved 13 February 2009. Wikimedia Commons has media related to Narva River.